Sadly, according to trends, we are in a high-activity flu area. TALK TO YOUR DOCTOR. Get professional advice if you are at risk for complications from flu. WASH YOUR HANDS FREQUENTLY. Flu viruses are spread by droplets from infected people when they sneeze, blow their nose, or wipe away secretions from their nose or eyes. During flu season, everyone should be encouraged to keep their hands out of their mouths, avoid rubbing their eyes and wash their hands thoroughly several times a day, especially before meals. EAT A HEALTHY DIET RICH IN VITAMINS C AND E. Foods containing these vitamins are believed to be helpful in supporting the immune system. Foods rich in vitamin E include sunflower and corn oils, sunflower seeds, and nuts such as almonds and peanuts. You can get your daily vitamin C from foods like orange juice, citrus fruits, broccoli, and green peppers. And make an effort to reduce your intake of concentrated sugar (e.g. soda, candy) because excessive sugar impairs the immune response. GET A GOOD NIGHT’S SLEEP. Lack of sleep may profoundly inhibit your immune system. Get a full night’s sleep to keep your body’s natural defenses at optimum efficiency. STAY HYDRATED. Increasing your water intake will help you stay healthy and lessen the chance of you coming down with flu. When you are feeling under the weather, drinking extra fluids prevents dehydration caused by fever, loosens mucus, and keeps your throat moist. Warm liquids are preferable, and there is some evidence that inhaling steam early in the course of a cold or flu may reduce the spread of viruses in your upper respiratory tract. KEEP OSCILLOCOCCINUM®READILY AVAILABLE. Oscillococcinum (Oscillo®), one of the world’s most popular natural flu medicines, can reduce the duration and severity of flu-like symptoms when taken at the onset of symptoms. Its use is supported by published clinical studies, as well as more than 65 years of use throughout the world. Plus, unlike other flu medicines, Oscillo does not cause drowsiness, it does not interfere with other medications, and it is recommended for both adults and children ages 2 and up. EXERCISE REGULARLY. Not only can regular exercise lower stress, but research indicates that exercise can stimulate the immune system and promote healthy sleep. In a recent study reported inMedicine and Science in Sports and Exercise, scientists found that modest exercise may prevent the elderly from getting colds and flu. LISTEN TO YOUR BODY. If you do come down with a cold or flu, take it easy. Spending excessive energy steals valuable resources from the immune system. Even attempting to perform normal activities at work or school may be too much. Besides, if you believe you’re coming down with flu, probably the best thing you can do for friends and family is to not expose them unnecessarily to the virus. SEEK HELP IF YOU GET WORSE. If your symptoms become significantly worse after the first three days of illness, especially if your fever subsides and then returns, be sure to seek medical attention right away. The reason that flu is considered a potentially dangerous infection is that it leaves the body vulnerable to other infections like pneumonia. Move Over Melatonin…Hello Tart Cherries! Melatonin works for many people who suffer from insomnia. If you have tried this and other sleep formulas, consider trying tart cherries or tart cherry juice. Researchers from Louisiana State University found that giving insomniacs tart cherry juice daily for two weeks increased sleep time by almost an hour and a half every night! Liu AG, Tipton RC, Pan W, Finley JW, Prudente A, Karki N, LossoJ N, Greenway FL. 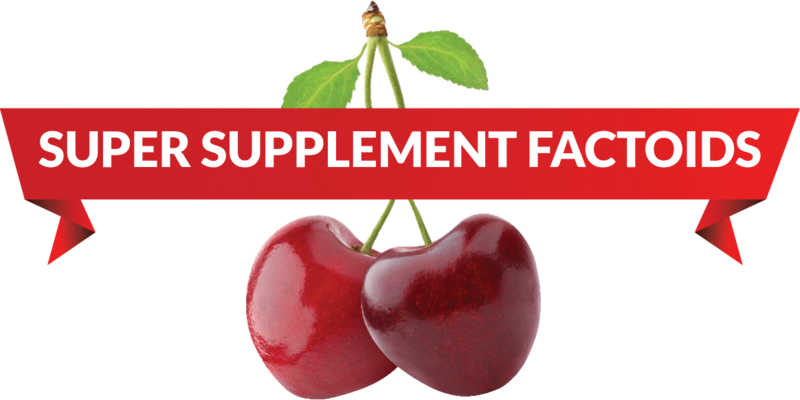 Tart Cherry Juice Increases Sleep Time in Older Adults with Insomnia. Experimental Biology Conference 2014. San Diego, CA. April 28, 2014. Why we need our SLEEP! The National Institutes of Health report that 50 to70 million Americans are affected by some kind of sleep disorder. If an individual does not get enough “quality” sleep through the night, it can significantly affect their health in several ways. Sleep disorders have been linked to many chronic diseases such as: hypertension, heart disease, stroke, depression, diabetes, and more. Sleep is such an important time for the body and mind to rest and repair from daily tasks. When we are able to sleep well, we wake up feeling refreshed and alert for our day-to-day activities. How well we sleep has a major influence on our overall quality of life. It affects how we look, feel, and perform throughout the day. There are the obvious tips we have all heard before to achieve better sleep such as: try a warm bath one hour before bed, keep the room as cool and as dark as possible, wind down before retiring (no TV or computer one hour before), go to bed earlier and rise earlier, no caffeine or sugar close to bed, have “white noise” such as a fan to drown out little sounds. So what happens if we try these and they do not work? Where does one go from here? The National Institutes of Health report that 50 to70 million Americans are affected by some kind of sleep disorder. Magnesium is one of the first products we look to for assisting with sleep because magnesium regulates more than 325 enzymes in the body. Sleep regulating melatonin production is disturbed without sufficient magnesium. The “feel good” hormone serotonin’s production depends on magnesium as well. Magnesium also regulates the way muscles function, and helps normalize adrenal stress hormones. We usually recommend a well-absorbed magnesium such as magnesium citrate or glycinate. Start with 300 mg near bedtime, and then add in another 300 mg during the day if bowels can tolerate (magnesium of any kind relaxes all smooth muscles). Melatonin is a natural hormone that our bodies produce. This hormone is not for everyone to try for resolving sleep issues. It has been found that our melatonin production decreases to about half by age 40. By age 60, we do not have much left at all. I have seen where melatonin helps certain clients that are 40 and older. This is not typically something we use for children because they tend not to have low melatonin levels. Hormones are tricky and need to be treated carefully. If you add in too much of one hormone, it can throw off the production of others and the body’s overall production of them as well. Start with 1 mg and see if you need more from there. Doses range from 1mg-3mg and higher. If stress is a culprit of sleep deficiency, then GABA Calm is a great product I usually recommend. This along with the magnesium is a product I utilize myself. GABA (gamma-aminobutyric acid) is an amino acid derivative and a key inhibitory neurotransmitter. It has an inhibitory effect on the firing of neurons and supports a calm mood. If you are one who tends to stress about the day, then this will help calm those over-firings down so the brain can wind down to sleep. **CAUTION– GABA Calm contains l-tyrosine which is not to be used with MAO inhibitor drugs. There are several homeopathic formulas that can also help with sleep problems. Try Hyland’s Calms Forte, Newton’s Insomnia, or Bach’s Rescue Sleep liquid melts. Teas like Sleepy Time tea, chamomile, and lavender can help one relax before bed as well. There are many other sleep formulas out there too. Some use valerian root which has had numerous human clinical trials conducted on it. Many have shown positive results to support a normal restful night sleep. Others may have lemon balm or hops added. Whatever product you select, you should first look at the root cause of the sleep issue and then address accordingly. If you are on any medications, you will need to speak to a healthcare practitioner before trying some of these supplements mentioned because of potential drug interactions.